11 oz. ceramic mug with Manchester University and crest logo in metallic gold. 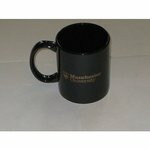 The MU mug is also dishwasher and microwavable safe.